Honoring My Compass: Day #36: Oh, Canada! Bonnie rode all 26 miles with me to Marine City this morning. I was really fortunate to have her as a host. 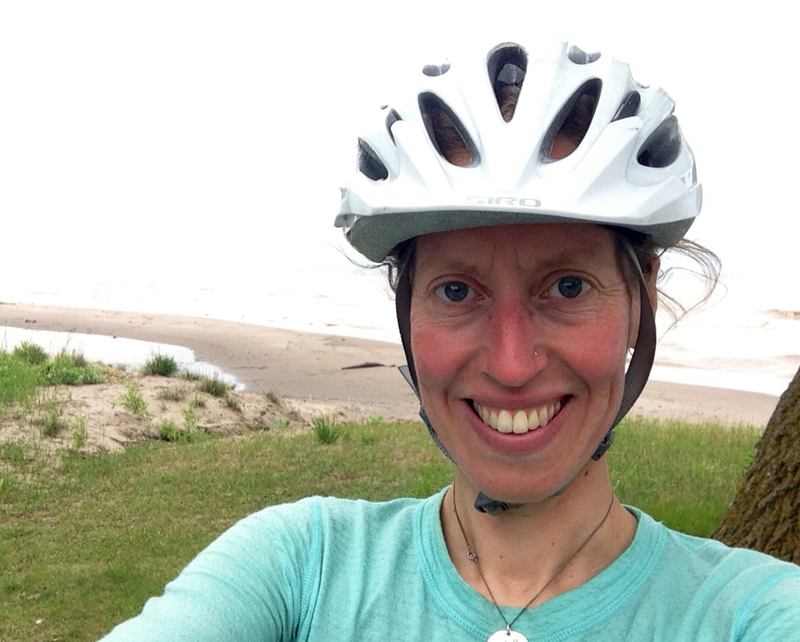 As an avid cyclists and having grown up in Marine City, she knows a lot about the area. She guided me along the most scenic route from Port Huron to Marine City, providing interesting historical and other tidbits along the way. 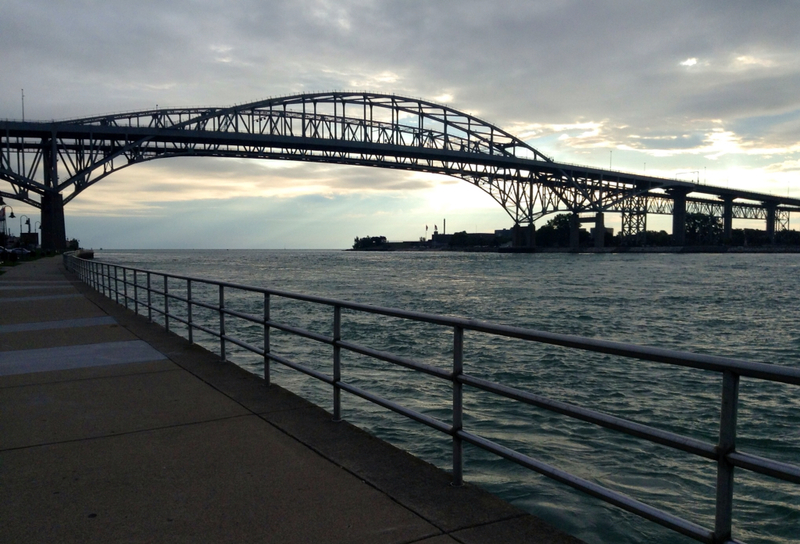 The beautiful Blue Water Bridges in Port Huron. When we arrived in Marine City, Bonnie and I parted ways. Too bad Bonnie couldn't join me for the rest of the trip. She would have made a great traveling buddy! 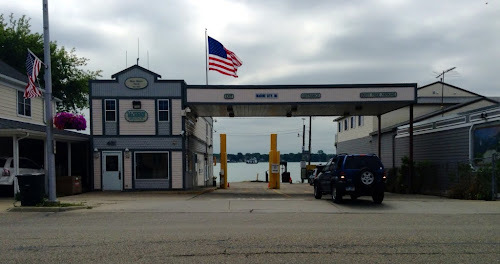 I stocked up on groceries, made some final calls (I'm turning off my phone while in Canada), and then biked the final mile or so to the Marine City/Sombra ferry crossing. I paid a whopping $1 to have me and Shirley transported across the St. Claire River, and then we passed through customs into Canada. The unassuming Marine City Ferry Terminal. This is the third time Shirley and I have ridden together in Canada. The first time was two years ago when we rode the Selkirk Loop. The second time was last year when we rode around Vancouver Island with my mom. And now we're entering Canada for the third time, as we bike across the continent. How exciting! I was expecting today's ride to be about 75 miles in length. I took a short detour to see Uncle Tom's Cabin in Dresden, Ontario, and a few other side trips made today's ride ten miles longer than expected. Tonight I am staying with a Warm Showers host, Bob, in Morpeth. Bob suggested an alternative route to his home. I'm really glad Bob's route went along Lake Erie, because I was instantly refreshed when I saw the water a few miles short of reaching Bob's home. With the lake at my side, I could have biked many more miles. Seeing Lake Erie for the first time. Bob splits his time between his home in Ontario and his home in Florida. He has travelled all over. I enjoyed hearing his stories about his recent travels to Eastern Europe and his trip to Peru. Bob told me about the Nazca lines in the southern deserts of Peru. Have you ever heard of these lines? The Nazca lines consist of hundreds of ancient geoglyphs carved into the stone in the ground. They are huge designs; distinguishable when seen from the air. They resemble animals and geometric shapes. One hypothesis is that the geoglyphs were carved by the ancient people to be seen by their gods. Another theory, provided by a Swiss historian, asserts that the lines were ancient runways used by extraterrestrial spacecrafts; the aliens thought that the Peruvian natives were their gods. 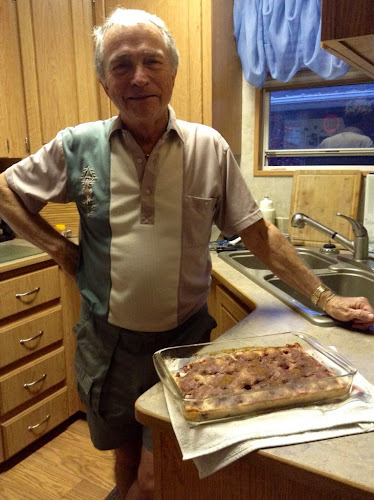 Bob and I enjoyed conversation over a three-course meal: a delicious salad, a veggie lasagna, and a dangerously delicious homemade strawberry cake! Bob and his Strawberry Cake. Over dinner, Bob asked if I noticed anything different when I crossed into Canada. I noticed two things: 1) the expression of distances in kilometers and 2) that warm, fuzzy feeling knowing that I was in Canada, a place where people just "get it." Bob said that most people notice more gardens and less billboards. 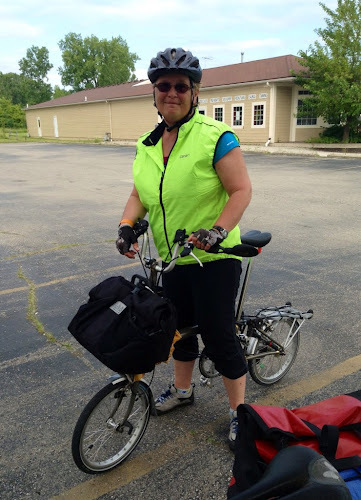 I may have noticed that as well had I been traveling in a car on urban roads, instead of on a bicycle in the country. I'm really enjoying the Warm Showers experience. The thing I love most is hearing everyone's stories from their travels and adventures around the world. The one thing I dislike about Warm Showers is hearing everyone's stories from their travels and adventures around the world; visiting with Bonnie, for example, has me wanting to join the Peace Corps, and visiting with Bob has me itching to visit Peru. Warm Showers = Dangerous Inspiration.